Indian jewelry brand, Gehna Jewellers, has collaborated with ASAL by Abu Sandeep, the renowned Indian couture duo, to create a transcendent jewelry collection – ASAL FOR GEHNA. Stand out pieces include ‘between the finger’ rings and earrings. 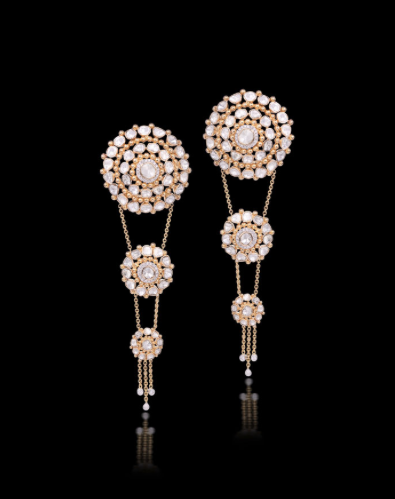 The collection comprises dainty pieces with mix of floral motifs encrusted on gold with uncut diamonds. Inspired by two iconic Indian flowers, the Lotus and Mogra or Indian Jasmine, the assortment mainly gives an ode to Polki (uncut diamonds).